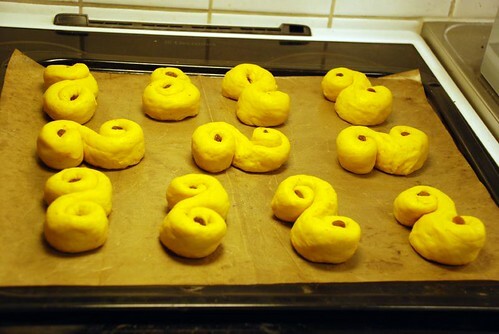 Today is Santa Lucia Day, which means celebrations all over Sweden with candles, music, glögg, gingerbread cookies and lucia buns - yeasted saffron buns, with raisins. 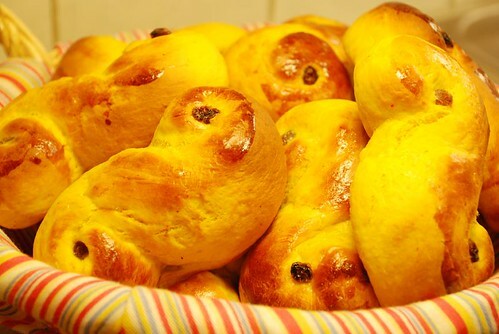 I wrote about Lucia two years ago, and I had another recipe for saffron buns last year. The problem with making saffron buns is that the saffron dries out the dough, and the buns go stale in no time. So make these on the same day as you plan to eat them, or put them in the freezer right away. They really won't keep well. That said, this recipe is really good and really easy. 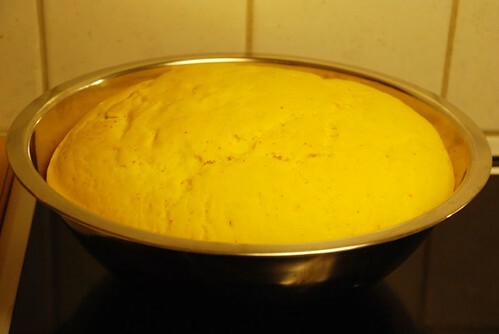 It has a lot of butter and cream, and that helps to keep the dough nice and moist, and it's really a dream to handle. You don't need much flour at all, and no extra when you shape the buns, and that's always good in terms of moistness. So, do try these - you won't regret it! Crumble the yeast into the bowl of your stand mixer (or a regular bowl, if making this by hand). Melt the butter, then add the milk and the cream and heat until it's about 37°C - it should just barely feel warm to the touch. Add this to the yeast and stir until it has dissolved. Put the saffron with a pinch of sugar in your pestle and mortar, and mix well. Add to the dough, along with salt, sugar, the egg and most of the flour. Work into a smooth and silky dough - it will look pretty sticky, so add the rest of the flour, but don't worry if it's still sticky. It's supposed to be. It shouldn't stick to your fingers though. Transfer the dough to a clean bowl, and leave to rise, covered, for 45 minutes. Then it's time to shape the dough. I started by dividing the dough into equal portions, using digital kitchen scales. I like my lucia buns fairly large - that, again, helps counter any dryness. The traditional shape is as you can see in the photo below a fairly tight "s". Place raisins in the middle of the swirls on each side. Place on a cookie sheet, cover, and let the buns rise for about 15 minutes. Brush with a beaten egg, and bake at 200°C for 8-10 minutes. I love your blog. And we celebrated St. Lucia Day this morning with my parents. I made buns with hints of cardamom and allspice. another great thing to do is to add a bit (about one tablespoon) of brandy to the saffron before adding it to the mixture, it brings out the flavour even better... i made 90 tapas-sized lussekatter yesterday for a christmas party tomorrow, freezer is full of them! thanks for an inspiring blog! Thx for the recipe - I've always wanted to make these.The dough is really different, it's not a standard yeast dough, but interesting, moist and chewy - I think I'll use it in the future. Only one surprise: I think I'm not that keen on saffron in bread or buns, which I had no idea about! Your Lussekatter look beautiful! I was planning to make these for Christmas Day (I hope the Santa Lucia Inquistitors don't come after me ;-)). Thanks for the tip that the saffron dries the buns out! Because I was going to make them a couple of days in advance. Have you ever made these using natural yeast (sourdough)? Ah, lussekatter ... I had them in mind, but baked something else with the pinch of saffron I had left. I hope you all had a wonderful Lucia in Sweden. Hannah - great tip, thank you! ptasia - it's basically the same dough as used for other sweet, yeasted buns, but with more fat added to counter the dryness. Chris, thanks!! I haven't made any in years, but they were surprisingly easy to make. Mmm they look very deicious. Apart from those who are named Lucas or Lucia nobody else celebrates this day down here. Forgive my ignorance: what is a glögg? Scarletflower - glögg is a spiced warm wine, sort of along the same lines as gluhwein. Very very popular in Sweden this time of year! how much dry yeast do u tink i should substitute for the 100g of fresh ones?? Karlsfoodie - well, I have no idea how large your dry yeast packages are, but... well, use twice the amount you normally would for a dough with 500 ml liquid? Love your blog. My parents were born in Sweden so we always celebrated Lucia Day with Lussekatter and coffee. Try putting the sticky dough in plastic wrap and then a plastic bag so it doesn't dry out and then into the refrigerator for 2 hours or overnight. It makes it easy to make the buns. "Saami"
Thank you for sharing this recipe (and the Pepparkakor recipe)! They are the best I have tried besides my mom's (which are hidden in her old cookbooks back home in Denmark). I live in the Canadian Arctic and the dryness affects the rising and baking times. I baked them for 10 minutes and it was not enough; the buns turned out doughy in the centre. Luckily I discovered this pretty much as soon as I took them out of the oven as I could not control myself and had one nearly immediately. I put them back in for another 3-4 minutes and it worked great. Ville bara tacka for receptet! Bor i USA och letade efter ett bra lussekatts-recept pa engelska, och dem blev verkligen jattegoda!! Vilken typ av saffran anvander du? 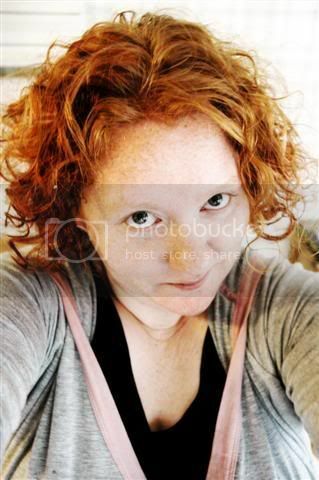 Jag hittar endast spansk saffran som inte alls ser ut som den saffran jag ar van vid och dessutom ar ganska dyr. Ar sa sugen pa att baka lussekatter! Åh, jag brukar använda den.. vanliga? som jag hittar på Ica? Typ Santa Marias, antar jag. Jag har inte testat nu i december, så vet inte om det är nån annan, jag hade kvar ett par påsar från tidigare.